Modak are traditional Indian dessert or I might say it is more of prasad ( food that is offer to god). Modak’s are small dumplings taste delicious and looks absolutely tempting. Modak’s are made with rice flour, jaggery and coconut. Outer layer of modak is prepared by rice flour and filling is prepared with fresh coconut and jaggery, later these delicious modak steamed. 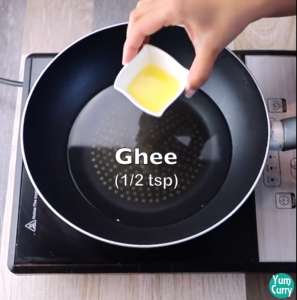 It is served by drizzle some hot ghee or clarified butter. Modak tastes amazing and it is easy to prepare with few ingredient, checkout my recipe to prepare tasty modak recipe step by step with photos. These modak’s are also known as ukadiche modak, ukadiche is marathi word that means “steamed”. There are another version of modak prepared by frying them in to ghee/clarified butter and these modak referred as fried modak. Modak’s are generally prepared during Ganesh chaturthi. Ganesh chaturthi is 10 days long festival celebrated as a birth of lord Ganesha. Lord Ganesha is the God of new beginning, wisdom and intelligence and obstacle remover. During 10 day festival there are huge pandal are installed for ganpati and lord Ganpati brought to the decorated pandal’s. We worship to pay our gratitude to the lord Ganesha. These are bit rounded exquisite heaven of sweetness. These almost exotica, available or made during Ganesh Chaturthi since they are considered loveable by Lord Ganesha. They are offered in abundance before Ganesha’s and you can see people making and sharing different kind of Modak with their near and dears. There are huge varieties of modak available in the market and they all belongs to different regions. Ukadiche modak is famous in maharashtra, this is an age old recipe and that has been passed from generations. Over a time these modak has been transferred and created in so many ways, but the charm for traditionally made modak is same. Some of the varieties of Modak like mawa Modak, Keshri Modak, Chocolate Modak, dry Fruit Modak, besan modak, fried modak, baklava modak, motichoor modak, Coconut modak and many more. 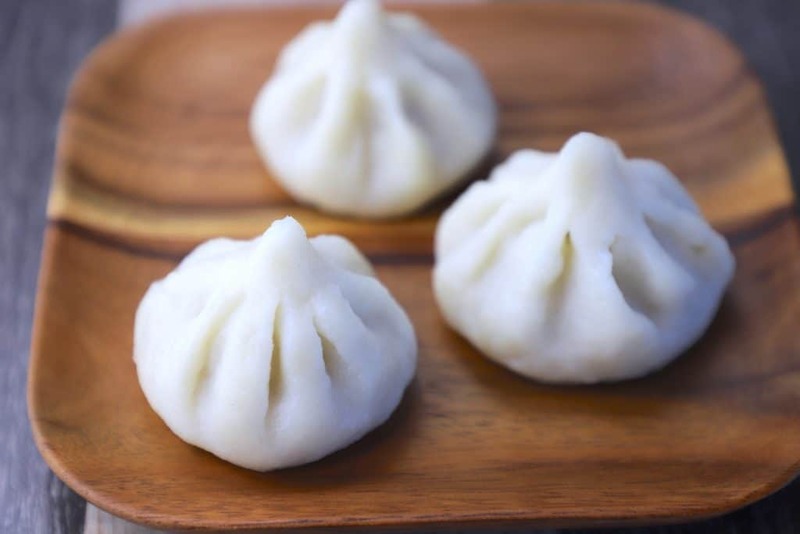 Steamed modak are perishable and has very less shelf life. Modak should be consume within a day or two after preparation. Modak are steamed and prepare with rice flour so they can easily spoil, its better to serve them hot or consume in a day. If you are frying the modak they can stay fresh for about 5-6 days. Modak is very delicious yet simple in making, they just need three ingredient rice flour, jaggery and coconut. 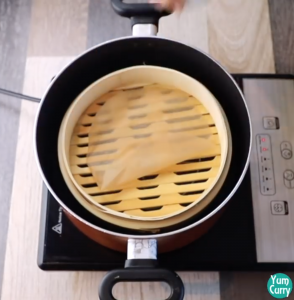 They are very easy to prepare so you can make them perfect in your first attempt. The tricky part in the whole process is to shaping up modak, but if you find it difficult you can buy mould and shape them perfectly. For making modak, we start with preparing filling then we prepare outer layer and later assemble and steam modak. 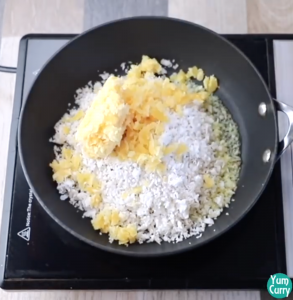 For filling the ingredient that are needed is grated jaggery and freshly grated coconut, if you want you can peal off outer layer(brown portion of coconut). 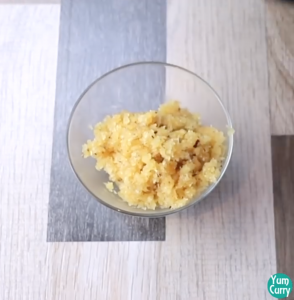 saute jaggery and grated coconut into the clarified butter. 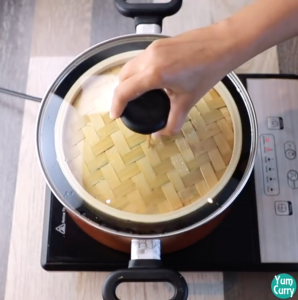 Stir in low heat when jaggery melt down completely and mixed with coconut switch off the heat. You can also add nuts and cardamom for flavouring to the mixture. For preparing outer layer of modak we need rice flour and water, boil water in to a pan, add rice flour stir until ingredient comes together. When water absorb and mixture become crumbly, switch off the heat. Let it rest for 10 minutes, when mixture cool down completely knead it to make a smooth dough. 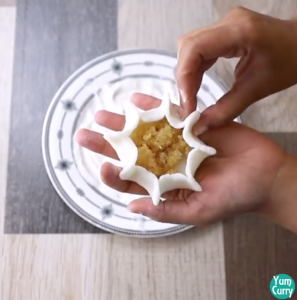 for assembling, Make a round circle from the dough and place coconut jaggery filling onto the centre of circle, for sealing it you can use you mould or do it by your self it is little tricky but it gives wonderful look to modak, for sealing make pleats on the edges of circle and gently seal them. 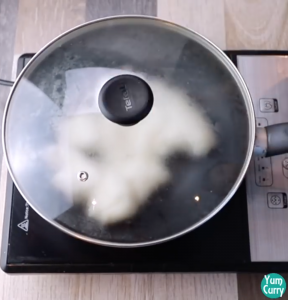 Now its time to steam modak, you can fry them in ghee as well. 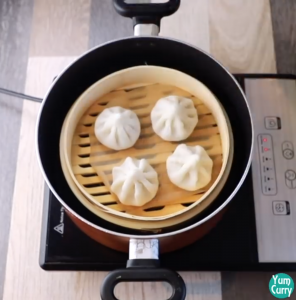 for steaming place steamer in to the deep pan with boiling water, place modak into the steamer and leave it for 10- 15 minutes, switch off the heat carefully touch the modak if they are not sticky means they are cooked. You can add dry fruits in filling like cashew, pistachios or raisin along with coconut-jaggery mixture. These are perishable food, so do not store them for long time. 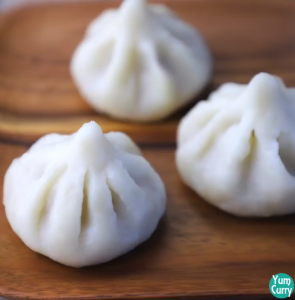 This modak can be fried instead of steamed. 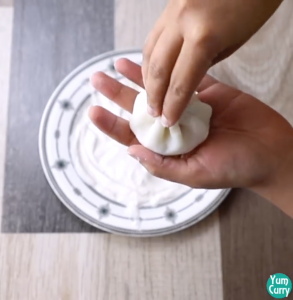 You can use mould for shaping up modak. I have prepared more dessert you can make during festivals like coconut barfi, besan barfi, mysore pak, khajur barfi, peda, gulab jamun, rasmalai, kaju katli click on the name to get full recipe. 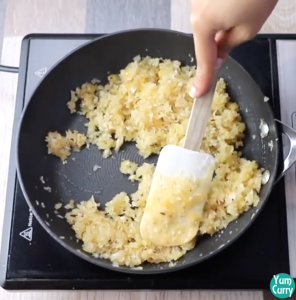 Add freshly grated coconut and jaggery to the pan. Mix all ingredient well and continuously stir until jaggery completely dissolve. When jaggery dissolved completely switch off the heat and transfer mixture to the bowl. Modak filling is ready keep it aside. Heat a Pan, Add 1.5 cups of water. Add 1/2 tsp ghee, let it boil. 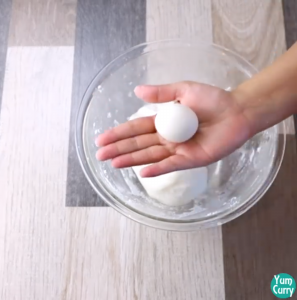 Add rice flour to boiled water, continuously stir for the lump free mixture. Cook mixture and continuously stir until all the ingredient comes together and start leaving sides of the pan. When the mixture turn like a soft dough, switch off the heat. Cover the mixture and let it rest for 15 minutes. Transfer rice flour mixture in to the bowl. Let it cool down. 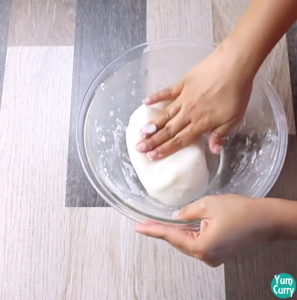 When rice flour mixture completely cool down, knead it by using hand until it turn soft and even. Take small potion from the rice mixture, roll between your palm. 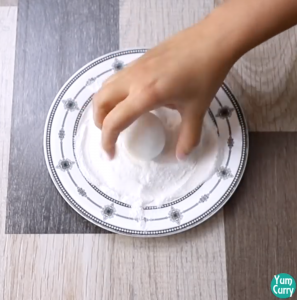 Roll rice flour mixture ball in to the rice flour. Press with finger and make it flat. Start stretching rice mixture with finger about 2 inch diameter circle. 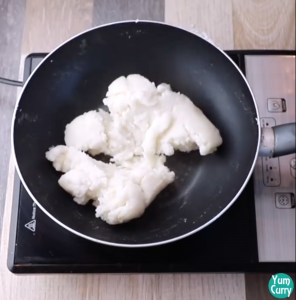 Take around 1 to 1.5 Tbps coconut and jaggery mixture and keep it in the centre of the rice flour mixture circle. Take all the mixture to the centre. For closing start making pleats to the edges of circle, gently combine all and pleats Seal the dough. For steaming, boil 1.5 cup of water in to a deep pan i am using wooden steamer, place modak in to the steamer. 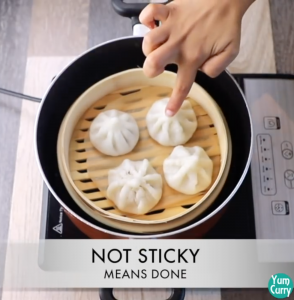 Let it steam for 10 minutes on low heat, to check whether they are cooked or not carefully touch the modak if modak become non sticky it means they are cooked. Tasty delicious healthy modak are ready. 1. 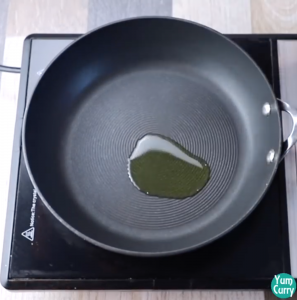 Heat a Pan, Add 1.5 cups of water. Add 1/2 tsp ghee, let it boil. 2. 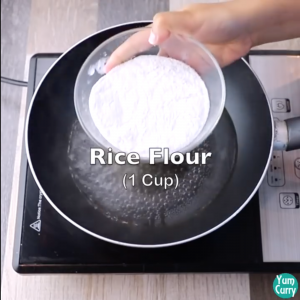 Add rice flour to boiled water, continuously stir for the lump free mixture. 3. 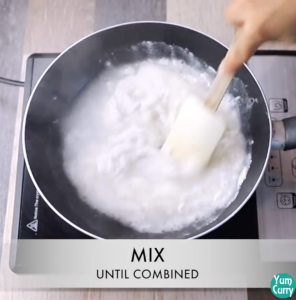 Cook mixture and continuously stir until all ingredient come together and start leaving sides of the pan. 4. When mixture turn like a soft dough, switch off the heat. Cover the mixture and let it rest for 15 minutes. 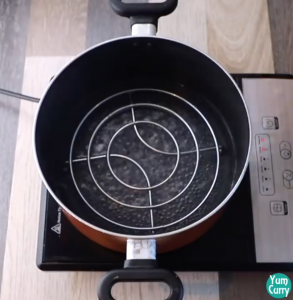 For steaming, boil 1.5 cup of water in to a deep pan I am using wooden steamer, when water start boil place steamer. Now place modak one by one in to the steamer.